I had previously reviewed the Manga Classics edition of Pride and Prejudice here. When I had the opportunity to check out Les Miserables, I took it, mostly out of curiosity. THE PLOT: This manga is an abridged version of the classic book, and I’m summarizing a great deal here. In 1815 France, Jean Valjean is released from prison (for stealing a loaf of bread) and finds that he can’t find honest work. Thanks to a kindly bishop, he is able to break parole, open a factory, and eventually become mayor of a town. One of his factory workers, Fantine, is unjustly fired and turns to prostitution to support her young daughter, Cosette. Valjean finds a dying Fantine and promises to care for Cosette, but his identity is discovered by Inspector Javert, who has been hunting for him. Valjean takes Cosette from the Thernadiers, the horrible couple who bilked Fantine for every penny, and finds sanctuary at a monastery. Years later, Valjean and Cosette live in Paris as father and daughter. Teen Cosette catches the eye of Marius Pontmercy, a young man who takes part in the June Rebellion. Valjean has to come to terms with eventually losing Cosette to marriage as well as facing his past, and his old enemy Javert. 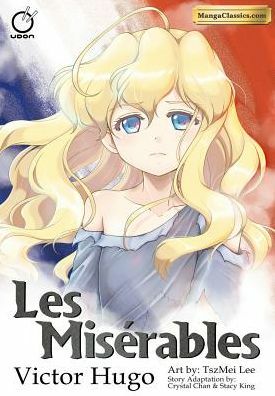 MY TWO CENTS: It’s been many, many years now since I read Les Miserables, and the manga includes a bit more story than you get in the musical version, but not much. The art is very interesting. Cosette and Eponine are drawn in traditional big-eyes format, as is Fantine as a factory worker. As Fantine’s fortunes fall, her image becomes more realistic. Jean Valjean and Javert are drawn more lifelike, so sometimes the combination of different styles can be jarring. Javert is a little too sneery for my taste (we know he’s “the villain,” but he operates from an overdeveloped sense of self-righteousness.) Eponine is far, far too buxom for a starving waif! BOTTOM LINE: A new (abbreviated) take a on well-loved story; check it out if you’re curious, but will probably be most-enjoyed by die-hard Le Miz fans. ON SALE DATE: Available now in hardcover and paperback.